Every person will end up in a situation in which they should know how to apologize in their lives, but there is a difference between saying sorry and offering a proper apology. A proper apology should address the specific details of a problem or disagreement, and how you plan to change. This knowledge is useful when offering an apology in private, as a business, or when offering a public apology. When making an apology, the six words you need to keep in mind are who, what, where, when, why, and how. A vague apology can feel dismissive and infuriate the person you want to communicate your feelings to even further. These details should always be at the forefront of your mind when deciding how to apologize. The United States has an official help page for those looking to offer an apology because it is considered a vital career skill. You may notice that their advice is very identical to Harvard’s list of apology essentials. That’s because offering a detailed apology is a vital skill in business and life. When you choose to apologize, you should make it clear who you are apologizing to. One of the most common mistakes is offering an apology to a room or a group of people, instead of engaging the injured party directly. It's also wrong to apologize to the people around the victim for causing a disturbance, without apologizing to the wounded party directly. Apologizing for making a scene helps to appease those in your vicinity, and addresses any inconvenience they've been put through. It is not the same as offering an apology to the injured party though and should be done separately. Whether you’re offering a personal or public apology, consider who the grieving party is. Make sure to say who you are apologizing to, and speak directly to them, or engage with the closest representative they will allow. You need to be clear what it is you are apologizing for. If you are unclear what mistakes you’ve committed, an apology will sound hollow. To prove you have a sincere desire to change and avoid making the same mistake in the future, knowing what you did wrong is a necessity. When apologizing, make it clear that you understand what the inappropriate action you took was. Explain your error, and how you intend to address it. Tell them how you feel about your past transgression, and explain what led you to the mistake, or how you will avoid making a similar decision in the future. When an apology is required, the wounded party often doubts your sincerity, and may look for vague wording or lies in your apology. The best way to prove yourself is to show candor, by making your apology as detailed as possible to eliminate all possible misinterpretations. Wars have been fought for less. A famous story in Japan tells that Ieyasu Tokugawa received a gold bell from a former enemy as an apology for their past disputes. An apology was etched on to the bell in the form of a poem, but the flowery language was vague, and Ieyasu interpreted it as a threat instead. In the end, the apology was refused, and the two went to war. Just like in that story, an apology can be easily misunderstood or dismissed if you don't clearly state what the heart of your dispute was, and make it clear that you know what your error was. Where you offer your apology is one of the details that can change the most depending on whether you’re offering a personal, formal, or public apology. When deciding how to apologize, remember that addressing a sensitive topic in the wrong location can be one of the largest barriers to effectively communicating your regret. In most personal disputes, an apology can be offered in a wide variety of locations. You can choose to apologize at home, in a public park or locale, or anywhere with an air of familiarity. If you need to offer a formal apology due to a corporate issue or a dispute at work, however, where you apologize at becomes much more important. An official apology offered at the site of an accident or the location where a dispute took place can show the weight you put on the incident and make an apology more impactful. This same logic can be applied to personal apologies. If you are apologizing for a personal mistake, like angering a loved one, apologizing in a location the two of you treasure can act as a reminder of how much value you place in your relationship. On the other hand, there are many locations to avoid when apologizing. Addressing a sensitive issue, such as an accident that cost a loved one, in front of a large crowd of onlookers can be seen as extremely insensitive. This also holds true for personal apologies about private disputes, especially when it may pull onlookers or other close friends into the dispute. Don't choose a location that will exacerbate the problem. If you must address the public, choosing a location related to the dispute can be helpful. If it is a personal issue, however, apologizing in front of their friends or loved ones can feel like an insult, or may escalate an issue so that a new apology is required to address that affront as well. One of the most difficult details to decide upon when apologizing is choosing the correct time for your apology. The common notion is that you should apologize as soon as you realize you’ve offended someone, but it is sometimes possible for waiting to offer an apology to be the right decision. Reiterating the importance of the five Ws and one H, if you don't know What you are apologizing for, you should not offer a hasty apology. If you apologize at the moment, you may also choose the wrong location for it. The important thing is to stop and consider how you can most effectively show your sincerity so that your apology isn't wasted words. You can’t always choose the right time for an apology. Medical professionals such as doctors and nurses are sometimes required to offer apologies during their work. Their apologies often have to do with the death of an individual, a mistake in their practice, or their insensitivity during an appointment. The death of a victim’s loved one can be an especially sensitive issue. Many medical professionals believe that offering an apology while the person is still grieving can make it seem less sincere, or it may be ignored. Unfortunately, many doctors fear the repercussions of a victim who is offended by an apology, and never get around to apologizing. A poorly timed apology is often a better option than never apologizing for a mistake, though. Sometimes a quick apology is a right answer, but an apology long after an incident may avoid opening fresh wounds and can still convey your feelings. Tell the person you are apologizing to why you have chosen to apologize. Not every disagreement is due to a misunderstanding. When you explain why you are apologizing, you can illustrate your line of thinking. Tell them what changed your mind about an issue, or why you didn’t understand your mistake before and how you’ve since come to understand it. Explaining why you are apologizing allows the wounded party to understand your thought process. This can help you to avoid future misunderstandings as well. Many disputes happen because one party is wrong but unaware of it, while the other believes the mistake is intentional. When you explain your thought process, this can sometimes be avoided in future conversations. The final reason telling them why you are apologizing is important, is because it helps to personalize the apology. People who learn how to apologize often begin to standardize their apologies. They can begin to sound like a copy-paste. Why you are apologizing is unique to each incident, however, and addressing it can bring out unique details that make the apology seem more sincere. The tone you take when apologizing has a large influence on how it is received. That’s why you should consider your audience when deciding how to apologize. When apologizing to a personal acquaintance or loved one, using formal language and a stiff medium like a written letter can be the wrong decision. If you have to apologize to a co-worker or in an official capacity, however, poor writing and overly familiar language can be just as appropriate. Consider your relationship to the offended party before you start your apology. One thing few people consider is their position relative to the victims. If you are their boss, a parent, or someone with authority over their lives, they may feel forced to accept your apology no matter how well delivered it is. If you are in a position of authority, take extra steps to show them that you are sincere. It’s more difficult to accept an apology from a guardian or boss, so strive to make a better apology than usual if a hierarchy is in play in your relationship. A good apology should be detail oriented. Before you apologize, think carefully about who, where, what, when, why, and how. You may apologize differently if you intend to address a single person or loved one, or a group or coworker. The location and timing of your apology should change significantly based on these details. The details are a necessary part of any good apology. Like any product, facial moisturizers are constantly updated to offer newer and better products. This list examines some of the best facial moisturizers of 2018. This list should allow you to choose the best facial moisturizer for you from a variety of products. All of the best facial moisturizer candidates are graded using a five-star system. Because all of these products are considered among the best, a low rating does not mean one of these facial moisturizers is bad. It merely means that it doesn't have as much versatility or use as other candidates for the best facial moisturizer available. 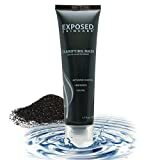 The rating for these moisturizers are based on the quality of the product, the opinions, and comments of ourselves and other reviewers, and the reception and feedback provided by users. Each rating is based on a combination of testimonies and experience during testing. Under most circumstances, only a single product will be reviewed from any facial moisture line or company. If two products are deemed different enough, they may both receive inclusion, but we strive to offer a variety of products and options in our rating system. Each product should be especially good at dealing with dry skin, oily skin, or a combination of the two. Some products may be better for certain types of skin, and these differences should be noted in their reviews. These are several products in contention for the title of best facial moisturizer in the market. All of these facial moisturizers are high-quality products, so your preferences may vary from ours. The intention is to present you with several options to choose from so that you can choose the facial moisturizer that is right for you. Neutrogena Hydro Boost is a unique facial moisturizer marketed as a gel-cream. As a gel, it takes far less Hydro Boost to cover your entire face than normal facial moisturizers. Neutrogena Hydro Boost is an everyday facial moisturizer and can be applied during the day or night. According to several testers, you have to apply it less often than other moisturizers, and the feeling of moisture on your skin is long-lived. It is an over the counter facial moisturizer and can be found in common stores from Target to a local drugstore. Though it isn't a luxury facial moisturizer, Neutrogena Hydro Boost performs far better than your average facial moisturizer. Hydro Boost doesn’t contain any chemicals that are known to cause blackheads. There are fewer ingredients in Hydro Boost, which limits the chance that you’ll have an allergic reaction. Neutrogena Hydro Boost receives a five-star rating. Although every facial moisturizer on this list has a unique quality to it, Hydro Boost is this list's top pick for a best facial moisturizer. Its availability, effectiveness, and the fact that it is significantly safer than other facial moisturizers make it a recommended product for any beauty product connoisseur. 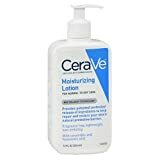 While CeraVe’s Moisturizing AM lotion is good, feedback from other testers led us to choose the CeraVe Ultra-Light Moisturizing Lotion SPF-30 instead. CeraVe's lotions are unique because they both moisturize your skin and provide protection from direct sunlight. One negative trade-off is that the chemicals used to give it an SPF rating can cause blackheads. The chance that it can irritate your skin may also arise since there are more ingredients than usual. No other facial moisturizer on this list fulfills the tasks of protecting your skin and moisturizing it. Ultra-Light Moisturizing Lotion SPF-30 is designed to be thin and light so that you can still apply makeup or other beauty products without smearing them together. Because it is part sunscreen, you’ll notice that it can leave white streaks and has a distinct smell to it. This is one of the best facial moisturizers to apply in the morning or before going outside. It isn’t a good product to use for a night time mask though. CeraVe Ultra-Light Moisturizing Lotion SPF-30 receives a three-star rating. It is the perfect definition of a product that fulfills a niche role but excels in that particular area. If you dislike moisturizers with a distinctive smell or want a product you can apply at night, this may not appeal to you as much. RoC Retinol Correction Deep Wrinkle Daily Moisturizer is our pick for a facial moisturizer with retinol in it. These vitamin-rich moisturizers market themselves as products capable of healing your skin, removing sun spots, and more. While this product claims to have anti-aging properties, you should take a skeptical look at any moisturizer that claims to have health benefits. At its core though, it functions as a very good facial moisturizer, and it makes it on to this list on those merits alone. RoC Retinol Correction Deep Wrinkle Daily Moisturizer also acts as an SPF-30 sunblock. This product does a lot and has many ingredients to make it all possible. The long list of ingredients means that several products known to create blackheads are in this moisturizer. The active ingredients included for their anti-aging and skin healing properties are also affected by sunlight. As such, this facial moisturizer is one you should put on at night rather than the daytime. 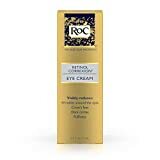 RoC Retinol Correction Deep Wrinkle Daily Moisturizer receives a two-star rating. It is a candidate for the best facial moisturizer to apply at night. Its numerous ingredients and exaggerated health benefits come with some drawbacks though that make it less useful outside of its intended role. An SPF rating is rather pointless if you shouldn't use it during the day. Cetaphil produces affordable facial moisturizers. Their Daily Hydrating Lotion isn’t a luxury moisturizer, but rather the kind you can apply each morning without worrying that you’ll run out because price becomes an issue. What elevates Cetaphil’s Daily Hydrating Lotion is its focus on dry skin. Facial moisturizers can fulfill a variety of roles, and this one focuses in on dry and scaly skin specifically. Ingredients like hyaluronic acid are included to help your skin retain moisture even when it is damaged or unhealthy. Shampoos and conditioners form a dichotomy where the shampoo removes oils and dirt but dries out your body. Conditioner products restore moisture to your body, to help undo any damage caused by the shampoos. 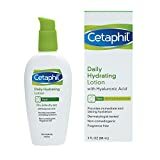 Cetaphil's Daily Hydrating Lotion is a conditioning product and is best used after you use a facial cleanser or other shampoo-like products. Cetaphil's Daily Hydrating Lotion receives a three and a half star rating. The lotion has many hydrating agents and fulfills the role of moisturizer well. It is designed to be useful even if your skin is already dry or cracked. It is also effective on sensitive skin. As a hydrating lotion, it is best used to deal with dryness, however, and it lacks some versatility as a moisturizer product. There's a common misconception about moisturizers. The role of a moisturizer is to stop moisture from escaping your skin and to improve your skin's water retention. For that reason, moisturizers don't actually need to be watery or thin. Moisturizers with high water content can dry up rapidly under sunlight, or may become clammy in high humidity. The Ordinary is a thick cream facial moisturizer. It can feel a bit heavy on your skin compared to other moisturizers, but the thick cream means it is excellent for dry or humid climates where other moisturizers would struggle. This is a heavy duty facial moisturizer capable of working effectively while allowing you to use makeup or other products as well. The Ordinary does have two ingredients to note: cetyl alcohol and sodium chloride. These ingredients can cause acne problems in some rare instances. Cetyl alcohol is an emollient though, and both ingredients fulfill useful facial moisturizing roles that make them worth the inclusion. If your skin is prone to pore-clogging however, it’s something to keep in mind. The Ordinary also doesn’t streak or cause discoloration on people with poor complexions, or any darker skin colors. Because The Ordinary is designed for people who live in hot climates, it makes sense that they’d consider how it interacts with tanned or dark skin. So if you’re worried about white streaks, or oily looking moisturizer spots, this product will help you avoid both. The Ordinary receives a four-star rating. It effectively fills the role of a facial moisturizer even in extreme conditions. It can address several issues other facial moisturizers face, such as itchiness, streaking, and the threat of drying out under sunlight. It also fills a niche role for those who need a moisturizer in humid climates, giving it a broad number of uses. Clinique's Moisture Surge Intense is a facial moisturizer that is designed for oily skin. Many facial cleansers deal with either dry or oily skin, and this product from Clinique does both to some degree. Its emphasis seems to be on eliminating and minimizing the oils on your skin, however, to reduce acne and other skin issues. Your skin naturally produces oils to protect it, and in some cases, even moisturize it. Some people have skin that produces an excess of oil though, which can quickly clog pores and cause acne. Any facial moisturizer used to reduce the oil in your skin should be used carefully because removing too much oil can damage your skin instead of healing it. 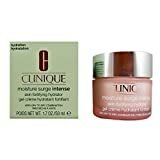 That said, Clinique's Moisture Surge Intense is a great facial moisturizer. If you have clear skin in need of moisturizing, you may want to hesitate before choosing Surge Intense. If it is the right product for you, however, it is excellent at limiting the oils present on your skin and keeping your skin in shape. Clinique's Moisture Surge Intense receives a three-star rating. This may be the best facial moisturizer for those who deal with oil on their skin. That does limit the number of people who will find it useful somewhat, though. It also isn't as effective in this role as skin cleansers, so for Clinique's product to be right for you, a few factors have to line up. When you are looking for the best facial moisturizer to fit your situation, you should first consider what you want your moisturizer to do. 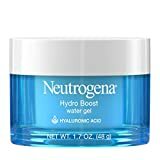 If you want a facial moisturizer that only fulfills that role, you will likely want a product like Neutrogena Hydro Boost. If you want to achieve the maximum bang for your buck, however, you may want your facial moisturizer to have other uses. The most common difference is between morning and nighttime facial moisturizers. Morning facial moisturizers are meant to be applied early and are absorbed as you go about your day. You are likely to be in sunlight and sweat during this time, so they can't be a runny product. Night time moisturizers should feel more comfortable on your skin so that you can rest after applying them, so a thick moisturizer is probably not the best choice. A good example of a daytime moisturizer is The Ordinary, which is long-lasting and usually won't leave streaks. You don't want a moisturizer that leaves marks if you have to attend a meeting or be in public after all. RoC Retinol Correction Deep Wrinkle Daily Moisturizer is the type of moisturizer you want for a nighttime mask. It feels lighter and has a higher moisture content. This means you're less likely to feel irritated or uncomfortable when laying down, so you may prefer this product instead. If you already suffer from dry skin or frequently use skin cleansers and other products that irritate your skin, you may want a facial moisturizer that is specifically tailored to provide greater hydration. If you have acne or dry skin issues, consider Cetaphil's Daily Hydrating Lotion. If you don't frequently suffer dry skin, however, you may want to choose one of the previous options. How Do Face Masks for Acne Work? Having great skin is every girl’s dream. While hydration, regular exercise, a healthy diet, and hygiene are crucial to achieving flawless skin, sometimes this doesn’t help. Acne is a common skin condition that both men and women experience. Fortunately, you can clear acne scars and nourish the skin with face masks. Face masks are an essential part of any skincare routine. Selecting the best face mask for acne can reduce any breakouts and leave you with smooth and glowing skin. Here’s everything you need to know about these face masks and our top products for acne prone skin. Face masks help to get rid of anything you don’t want from your skin; this includes excess oil and dirt. Also, the masks nourish your skin with what it needs. It’s ideal to use the best face mask for acne twice or thrice a week to get its benefits. When you apply the damp mask, your skin absorbs the minerals. As the clay dries up, it binds the dirt and oil on your face, something that helps clear out the pores and stimulate blood flow. You can now enjoy a glowing and soft skin. While having a fantastic face mask is critical, you need to apply it the right way to get the most out of it. Here are some steps to follow. You need to clean your face and neck before applying any product to avoid trapping impurities. Ensure you use warm water to open your pores, which creates the best environment for the mask. Make sure that your hands are clean before you apply the mask. Spread the mask without tugging on the skin. Use upwards motion when applying the product. Read the instructions on the product to understand how long you need to keep the product on your skin. Some masks can end up clogging your pores while others can dehydrate the skin. Wash the product off with warm water or cold water depending on the instructions. After washing off the mask, avoid rubbing with a towel as this may irritate sensitive skin. You can let the skin air dry or use a soft cloth to dry off any excess water. Do not use a face mask for a single day each month. It’s best to use the mask at least twice a week to get its benefits. Also, continue using e moisturizer and toner for your skin type to experience better results. Before listing down the best masks for acne, we chose products with key ingredients that help reduce acne breakouts. Also, we read multiple reviews from satisfied users who felt that these products gave them the desired results. All the listed products contain ingredients that help soothe the skin and promote natural healing. Here the best face masks for acne in 2019. Era Organics is an excellent facial mask if you have large acne scars. The product has quality ingredients like Manuka honey that limits pimples and has antiseptic properties to promote healing. Another benefit is that the microdermabrasion face scrub exfoliates your skin, leaving you with a bright, while preventing future outbreaks. The mask is 100% natural and is fragrance and perfume free. However, Era Organics facial mask may not be ideal if you have sensitive skin. Furthermore, it can be harsh if you misuse it. 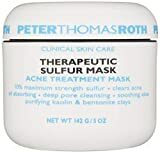 Peter Thomas is a popular name in the skincare business, and the therapeutic anti-acne masque doesn’t disappoint. Its primary ingredient is sulfur which cleans the skin’s surface, exfoliates dead skin, and removes blemishes. Some notable ingredients include eucalyptus oil which hydrates your skin and Kaolin clay which absorbs excess oil from your skin. Unlike other masks that only deal with acne scars, this sulfur masks has skin cleansing benefits to give you a natural glow. You’ll only need to use the mask once a week on your face and neck area. On the downside, the mask can dry out your skin. If you have dry skin, it’s best to leave the mask on for five minutes to see how your skin will react to the product. The Acne Clarifying Mask by Exposed Skin Care has the best ingredients to help with the treatment of acne. Some key ingredients include micronized benzoyl peroxide, salicylic, sulfur, and resorcinol. These ingredients help to remove dirt, toxins, and sebum from your skin. What’s more, they cleanse the skin, which helps to reduce future acne outbreaks. Exposed Skin Care goes a step further to add an herbal blend to soothe the skin. You only need to use this treatment twice a week when starting and switch to once a week. Although this mask is excellent if you need a product to reduce irritation, it’s not the best for sensitive skin due to the clinical strength ingredients. 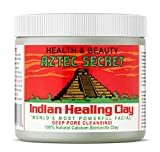 The Aztec Secret Indian Healing Clay provides therapeutic benefits, and it’s known to prevent blackheads and pimples. With 100% pure clay as its main ingredient, you can be sure of a product that cleans and removes excess oil. Moreover, the mask works to prevent future acne outbreaks while providing other therapeutic benefits. If you have sensitive skin, you’ll find this mask soothing as it doesn’t irritate the skin. The only disadvantage is that it requires preparation before use. You need to mix the clay with water or raw apple cider vinegar before using it. Also, it can be messy to apply compared to other masks. The Mistine Egg White and Anti-Blackhead Peel -off mask work to fight acne and brighten your skin. Some ingredients include collagen, hydrolyzed elastin, and albumen which work to reduce breakouts, tighten the skin, and clean your skin. Those with severe acne scars will find this mask beneficial as this mask helps to reduce the scars. Another feature that makes this mask stand out is that it’s a peel-off mask, which means you don’t need to wash off. You need to use the mask once to twice a week for the best results. Leave the cover for twenty minutes before you peel it off. However, the mask may leave a residue after peeling leaving your skin feeling dirty. The good thing is that you can rinse it off immediately. 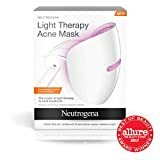 Neutrogena Light Therapy acne mask is UV ray free, which means you won’t have to worry about skin damage. Another benefit is that it’s affordable and you can use it for 30 treatments. Also, the acne mask is easy to use as all you need is to put it over your face and turn it on using the activator. The mask also helps you remove bacteria which heals your skin. What’s more, you can use it for any skin type. On the downside, you need to use the mask for some time before you see any results. Unlike other masks where you only apply, the Neutrogena face masks needs you to plug in the activator into the mask and turn it on for it to work properly. Juice Beauty Blemish Clearing Peel, 2 fl. oz. The Juice Beauty blemish clearing mask cleanses the pores and clears out acne scars, leaving you with a smooth and brighter complexion. This product has bamboo as its main ingredient. Bamboo has antiseptic properties which help to detoxify the skin. Other ingredients like Vitamin E, Vitamin B5, and Zinc Oxide reduce inflammation while the vitamins improve your skin’s elasticity and promote hydration. To apply this mask, cleanse and gently exfoliate the skin. Apply a layer of the mask to your face and neck. Leave the mask on for ten minutes and rinse it off with cold water. Repeat the routine once a week to get the best results. One disadvantage is that the Juicy beauty blemish clearing mask dries out skin and it’s not suitable for people with dry skin. Also, you may need to use it consistently to get the desired results. Acne face masks help treat acne. Although these masks are in one category, there are of different types depending on particular uses and the ingredients. When buying a face mask for acne, you need to consider some essential factors for best results. Find a detailed face masks for acne buyer’s guide. It’s vital to know your skin type before buying any acne face mask. The different skin types include combination, oily, dry, sensitive, and regular skin type. Regular skin has small pores and a few blemishes. Dry skin is prone to wrinkling and flakiness although it has small pores. Oily skin develops blemishes quickly, and it’s greasy with large pores. Sensitive skin breaks out often, and it’s prone to redness and irritation. Individuals with combination skin have a mix of oily and dry skin in various parts of their face. You can develop acne with any of these skin types. It’s best to find a mask that suits your skin type. Salicylic and Glycolic acid: salicylic acid helps to clear and prevent pimples while glycolic acid removes dead skin and promotes new cell growth. Colloidal sulfur or Benzoyl Peroxide: both ingredients work as anti-bacterial agents in acne face masks. The sulfur exfoliates dead skin and reduces inflammation. Bentonite or Kaolin clay: the clay act as detoxifying ingredients which helps to reduce redness and expel toxins. Also, the clay soothes the skin. Acne face masks are different depending on how long you need to leave them on and the times you need to use them. You need to wear some masks for five minutes while others take up to 30 minutes. Moreover, some masks work best when you use them a few times a week, while others only work well once a week. You can find acne face masks in different sizes. It’s vital to check the duration and frequency of use when comparing various products. Some small products are to be used less frequently, which may work just like a large product. There are five main types of face masks for acne. Each type works for the specified skin type and acne outbreak. The main categories include hydrating, exfoliating, anti-aging, soothing, and purifying acne face masks. Soothing face masks work well for people with sensitive skin as they contain natural ingredients and are gentle on your face. These masks scrub your skin without any irritation or leaving a reaction. Hydrating face masks are best for people with dry skin type as they help moisturize the skin, something that helps reduce the risk of acne. Purifying face masks get rid of dirt from your skin, absorbs excess oil, and cleanse the pores. These acne masks contain sulfur or clay as their main ingredients. Exfoliating masks remove toxins and dead skin left by acne scars. This helps you achieve a flawless complexion with a reduced risk of getting acne. Anti-aging face masks are ideal for mature skin. Apart from reducing your risk of developing acne, these masks minimize wrinkles and fine lines by exfoliating the skin surface. You can also find acne face masks that include hypoallergenic, organic, and vegan options. Hypoallergenic masks do not contain any fragrances and are ideal for sensitive skin. Organic masks have natural ingredients while vegan products do not have animal products. It’s critical to note that there’s a no one size fits all when looking for the best face mask for acne. You need to find a mask that works for your skin type. Choose one of the above acne face masks to get rid of acne scars, and achieve flawless skin. How to be more charismatic means having a presence that commands attention in any room. You don't have to be loud or boisterous to make others consider you charismatic. Instead, charisma comes from attentive listening, engaging directly with your audience, and maintaining a certain level of composure even as conversations dance back and forth through multiple topics. In sociology, there’s an idea known as the presence of social contagions. When in a group of people your mood can be affected by how the people around you feel, in the same way, an illness can be easily spread in a group. Keep social contagions in mind when practicing how to be more charismatic. When you are in a group, a failure to engage one of the participants can cause them to feel uncomfortable or awkward around you. You won’t seem charismatic, and others may pick up on their feelings, causing you to seem less compelling to the whole group. You should always know your audience. Charisma is about how others perceive you. You should try to adopt a persona that doesn’t exclude others from a conversation, and welcome new speakers or ideas when engaging others. This idea goes both ways. If you are uncomfortable or aren't attentive while others are speaking, it's likely people will notice. This will affect how they behave while listening to the same person. If you want to be charismatic, pay attention and listen in a way you'd want others to listen to you. One of the cornerstones of charisma is having a solid presence in any conversation. Have you ever heard the phrase “Listening, but not hearing”? Your posture, subtle actions, and more are being judged when you listen to others. Attentive listening is a skill, but it's widely considered one of the most important for charismatic individuals. When learning how to be more charismatic, to practice attentive listening, you should learn to look the other person in the eye while they speak. Focus on details of the conversation, such as who they’re talking about, where it happened, and why. When they pause, recite some of the information they’ve given, both to summarize it for yourself, and to show that you were engaged. Being charismatic means having an enthralling presence. That can be much more difficult if you aren’t facing the person speaking to you. It’s even harder if you interrupt them by checking your phone, asking questions while they’re still speaking, or fidgeting in your seat. One thing that helps to improve your charisma is to make sure that the subject of your conversation is something the listeners can relate to. You do this in everyday conversation through the use of similes, metaphors, and analogies. When you take them to the extreme, too many comparisons can make your conversation hard to follow. Still, it is a necessary art to master if you want to be charismatic. If you try to explain a subject matter that's wholly alien to your audience, even the most charismatic person will only meet with partial success. When you want to appear charismatic to another person, pause before you meet them or speak. Use this time to think about who they are, and what they’re familiar with. If you need to relate information to someone that they’re unfamiliar with, think about appropriate references and metaphors beforehand. Charismatic leaders throughout history have often used analogies when speaking to audiences to relate the struggles of one group to another. This is a skill that people like Martin Luther King Jr., Vladimir Lenin, and even Adolf Hitler mastered. This applies to more than conversation topics. If you plan to speak to someone who often meets with business owners and executives, you may want to adjust how you dress. A suit and clean shave may make them more likely to notice your presence and engage with you. Knowing your audience is possibly the most important step to increasing your charisma. A common saying for young adults fresh out of college is to dress for the job you want when attending an interview, rather than the job you have. If you work in construction but want a desk job, don't meet the interviewer wearing a hard hat. Everyone looks for similarities when engaging with other people. If others can find more similarities when engaging with you, the chance they’ll consider you a charismatic person will increase. Reflecting the mood of those around you can improve your charisma, and help you become the most important speaker in a group or organization. Both charismatic individuals and social wallflowers can have an interest in the topic at hand. If you want to know how to be more charismatic, the difference is often how you show or project your interest in a subject. When in a small circle of people or personal discussion, ask questions as others talk about an issue. If you’re the one speaking, include details that you take particular issue with, and make your feelings clear on matters. Just remember to keep the details that you engage with relevant to those you are speaking with. Being charismatic is a balancing act. Even when speaking about a topic that both you and your audience cares about, like clothing, your tastes will differ. A long-winded speech about articles they don't find interesting can quickly lose your audience's interest. You can take steps to improve your charisma without saying a word. When you have to appear at a location or before a group of people, think about what that location means and how it relates to those you’ll be around. Wearing a local logo, visiting the site of a tragedy before speaking about it, and showing interest can make your words all the more compelling. One example of this comes from the WWE (World Wrestling Entertainment). The wrestlers perform before large audiences every week. To engage their audiences, the villains of these shows often insult local sports teams or communities. These performers research the area they will perform in ahead of time, to make their speeches more engaging. Although being passionate about subjects will make you a more charismatic speaker, shouting and losing your temper can have the opposite effect. If you want to be charismatic, you must remember to listen intently even when confronted with different points of view or touchy subject matter. Maintaining your composure will make you seem more charismatic. Accepting the opinions and information put forward by those around you will make them feel more actively engaged by you. If you change your mind or accept new details when others present them, express your change of heart and acknowledge their ability to influence your thinking or change your mind. By that same token, you seem more self-assured when you maintain your stance while welcoming different points of view. You project a stronger aura of leadership when you can accept disagreements without losing your cool, and take your time to explore both points of view. If you seem knowledgeable and self-assured, many people will place more weight on your opinion. If you brag when you’re correct or continue to berate others about an issue when you believe they’re wrong, however, you can seem less charismatic by comparison. An important part of being charismatic is learning when to stop speaking or drop a topic entirely. When a conversation does become complicated or heated, remember the first tip; use details. When you address the members of your conversation by name, it acts as a reminder that you disagree with a particular detail or person, not the conversation as a whole. Using specific dates, naming people related to the issue, and other details also make your point seem more credible. A good sense of humor is important to improving your charisma. Don’t mistake telling jokes and trying to be an entertainer with having a good sense of humor. A charismatic individual makes others feel comfortable in their presence. A good sense of humor goes a long way in making others relax. When speaking about serious issues, remember to include a joke or two to lighten the mood, but don’t linger on them too long. Always focus on the topic at hand, and don’t ignore the most relevant issue to your audience. Having a good sense of humor is about laughing at the jokes of others more than it is about amusing others. Even if you don’t think a joke is particularly funny, consider smiling or letting them know you appreciate their attempt at humor. Remaining silent or making others feel bad about their humor can cause them to feel enmity towards you, instead of awe. If you’re a relaxing presence, you are more likely to be considered a charismatic person. Having an authoritative voice can be a key influence on how charismatic you are when you’re trying to change other people’s minds. In personal conversations and issues, however, sometimes it’s how you treat other people’s feelings that make them consider you a charismatic individual.